Globe Fire Sprinkler has expanded its UL Listing for our Specific Application Attic Protection scheme utilizing RE and DS sprinklers. As part of our continued innovations on a constantly evolving new attic protection concept, new criteria has been added for scenarios where Single Slope roofs exist. This will allow for Single Slope roofs with Slopes of 3:12 to 6:12 and Spans of up to 20 feet with a single line of DS sprinklers or Spans of up to 36 feet with two lines of DS sprinklers. Required system demand flows can be as low as approximately 100 gpm (excluding over discharge) for Wet Systems and 140 gpm (excluding over discharge) for Dry Systems. 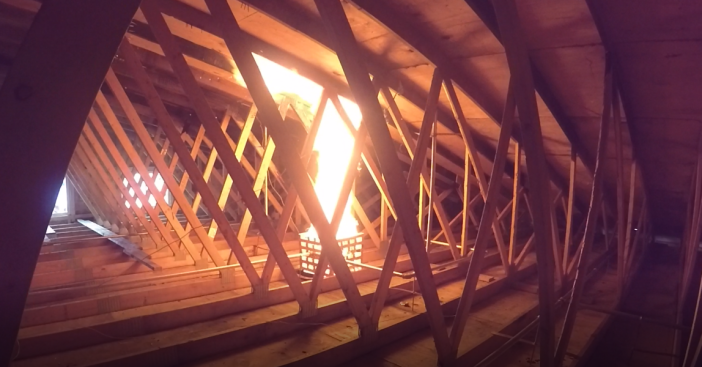 In June, Globe introduced a new attic sprinkler protection scheme that offers compliant protection with far less water – which can lower total system demand and cost. Attic system demands can drive the size of system risers, underground and feed mains for an entire project. Globe's new attic protection scheme strategically locates specifically designed sprinklers to optimize appropriate sprinkler activation, resulting in significantly reduced total system demands. “By rethinking the placement of sprinklers in the attic space, we’ve developed a way to significantly reduce attic water demand,” commented Globe New Technology VP Kevin Maughan. For technical information, contact TechService@globesprinkler.com or 989.414.2600. For price/availability, contact DomesticSales@globesprinkler.com or 989.846.4583.